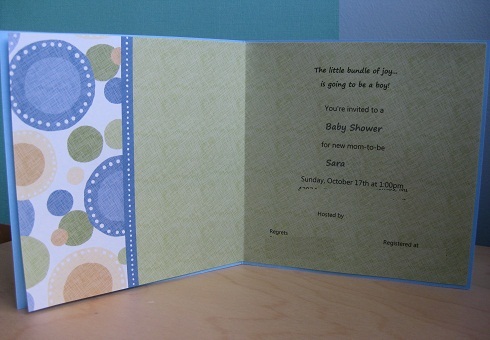 I'm hosting a baby shower for my Sister and I thought I'd make the invites as a fun project. It turned out to be a lot more work than I expected but the end result was good. I want to thank my Mother-In-Law for all her help. She visited and brought her Cricut paper cutting machine. She cut out the giraffes with the "Create A Critter" cartridge. The giraffe is actually 3 different cutouts layered and glued on top of each other. She used a different cartridge to cut out the party wording, but I'm not sure which one. 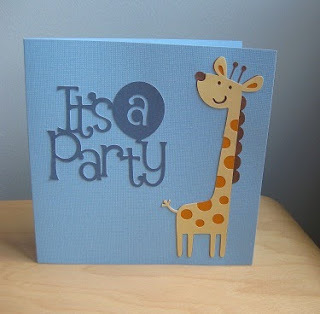 I glued everything to the front of square invite cards that I bought at Jo-Anns. It costs 20 cents extra to mail square invites so I had to buy 64 cent stamps. ﻿For the inside of the card I found this fun green paper with dots (to carry the giraffe spots to the inside in a way) in the scrapbook isle. I used a nifty Fiskars paper cutter (that I got for half off!) to cut it to the proper size. I was able to get two inserts out of each sheet of paper. I then got on the computer to assemble the inside card text. After many many test runs on plain paper I was finally ready to print. I found that the printing came out best when I set the printer to print "fine" quality and checked the box for "slow drying paper". Then I folded the inserts and glued just the right side/half down in the card. Off they went in the mail today! Very cute!! I just did homemade Christmas cards. I will post in a couple of days. Thanks Angie! I can't wait to see your Christmas cards when you post them.